No team in the NFL has been more criticized over the last two seasons than the Dallas Cowboys. With arguably one of the most talented squads on both sides of the football, the Cowboys have been under tremendous pressure to produce a winning football team and contend for a Super Bowl title, but they just haven’t been able to live up to their high expectations. Despite being in third place in the NFC East division standings coming into Week 6, the Dallas Cowboys do have a shot at redemption this week as they will face off against a very good New England Patriots offense. If the Cowboys can pull off a win in Week 6, the pressure will be lifted for at least one week as they will have proven they can contend and beat one of the best teams in the NFL. As it always seems to these days, all the pressure will be on quarterback Tony Romo to get this team going in Week 6. With all the blame being directed at Romo for the Cowboys slow start, the veteran gunslinger will have to have a good performance in Week 6 in order to quite his critics and get his team back on track. With a 2-2 record and coming off a much-needed bye week in order to get players like Miles Austin and Dez Bryant back to 100%, the Dallas Cowboys will have no excuses on Sunday as they will have to go into a hostile territory and get the best one of the best quarterbacks in the league. With Tom Brady having another MVP caliber season under center for the Patriots, New England has been nearly impossible to stop on offense this season as the three-time Super Bowl champion has been surgical the way he has torched opposing defenses. Despite the defenses for both teams needing to step up in this matchup in order to cool off the potent offenses, the attention will be on the offensive side of the football in what could potentially be the highest scoring game of the week. This will no doubt be a game in which the defense takes a backseat and the offenses reign supreme. 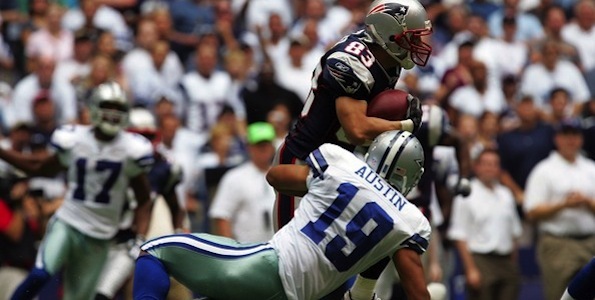 The return of Pro Bowl wide receiver Miles Austin should be a much-needed boost for Tony Romo and company, but I’m not sure it will be enough to lead them to victory over a New England Patriots team that has only truly been challenged once this season (loss to Buffalo Bills). It will be all about the fourth quarter for the Dallas Cowboys in this game with the football in Tony Romo’s hands. If Romo can play up to his potential in the fourth quarter, the Cowboys have a great chance of pulling off the slight upset. As of right now, the New England Patriots are favored to come out on top in this matchup with a -7 point spread. Even though I believe the Dallas Cowboys could win this game, the Patriots are a safe bet with this spread.